‘Fruit very large, sometimes measuring six inches long, pyramidal. Skin greenish-yellow, considerably covered with dark grey russet in the shade, and entirely covered with light brown russet on the side next the sun. Eye small, set in a pretty deep basin. Stalk an inch long. Flesh coarse-grained, crisp, juicy, and sweet, ripe in October. Its size is its only recommendation.’ [Hogg – Fruit Manual p.174/1830]. ‘Originated by Van Mons in 1823.’ [Pears of New York p.486]. Figured in Le Jardin Fruitier du Muséum as ‘Calebasse’ [JFM vol 4/1861]. Also figured in Saint-Hilaire pl.58/1828, the illustration used here. Listed only in the 1857 catalogue in an Addendum as ‘Beurré Calibasse grosse’. This is amended in Macarthur’s hand to ‘Beurré Calebasse grosse’ in a copy of the catalogue used by him for this purpose [Pear no.47/1850]. In the same 1857 catalogue the number ‘47’ is changed to ‘38’ and this aligns with the diary numbering. ‘47. Bad.’ [Diary B, MP A2951/1862]. Obtained from Veitch’s Nursery, probably the original Exeter premises. 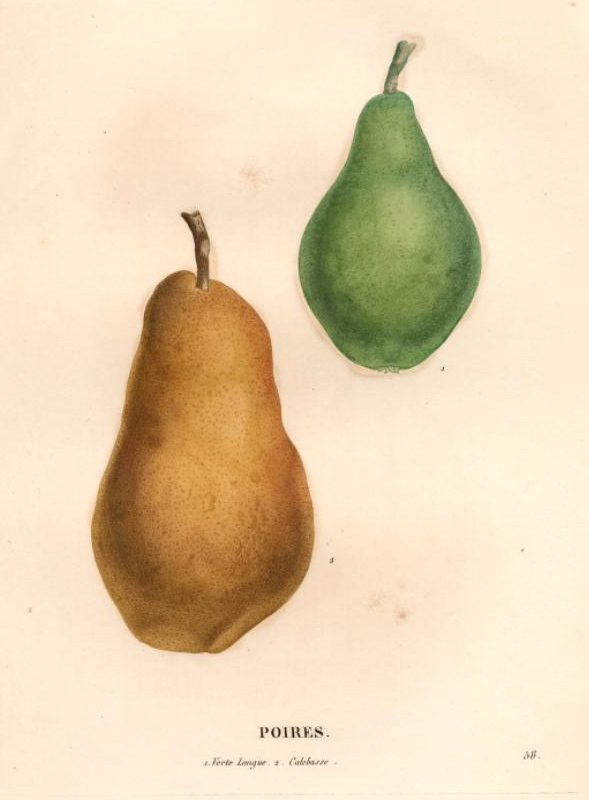 Pear Calibasse Grosse | Saint-Hilaire pl.58/1828 | BHL. Calibasse Grosse is the bottom pear.